It's 1903. Nora Kelly, twenty-four, is talented, outspoken, progressive, and climbing the ladder of opportunity, until she falls for an attractive but dangerous man who sends her running back to the Old World her family had fled. Nora takes on Paris, mixing with couturiers, artists, and "les femmes Americaines" of the Left Bank such as Gertrude Stein and Sylvia Beach. But when she stumbles into the centuries-old Collège des Irlandais, a good-looking scholar, an unconventional priest, and Ireland's revolutionary women challenge Nora to honor her Irish blood and join the struggle to free Ireland. 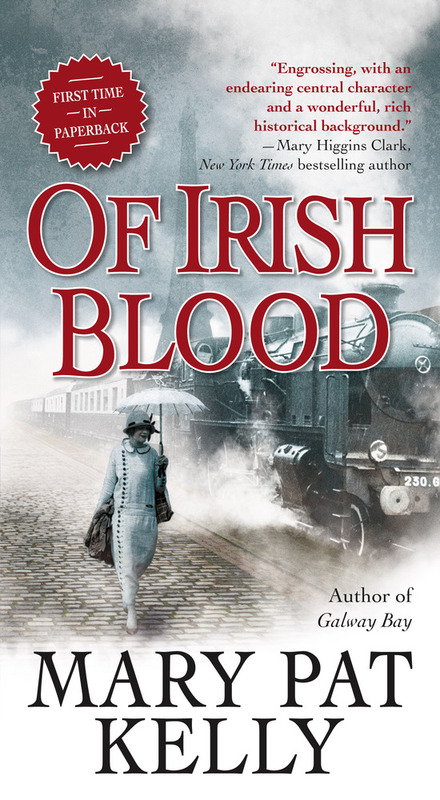 Author Mary Pat Kelly weaves historical characters such as Maud Gonne, William Butler Yeats, Countess Markievicz, Michael Collins, and Eamon de Valera, as well as Gabrielle Chanel, Gertrude Stein, James Joyce, and Nora Barnicle, into Of Irish Blood, a vivid and compelling story inspired by the life of her great-aunt. MARY PAT KELLY worked in Hollywood as a screenwriter for Paramount and Columbia Pictures and in New York City as an associate producer with Good Morning America and Saturday Night Live. She wrote the book and lyrics for the musical Abby's Song. Kelly received her PhD from the City University of New York. Born and raised in Chicago, she lives in Manhattan with her husband, Web designer Martin Sheerin.